The Right's strategy for undermining unions may be a shade more subtle than we think. 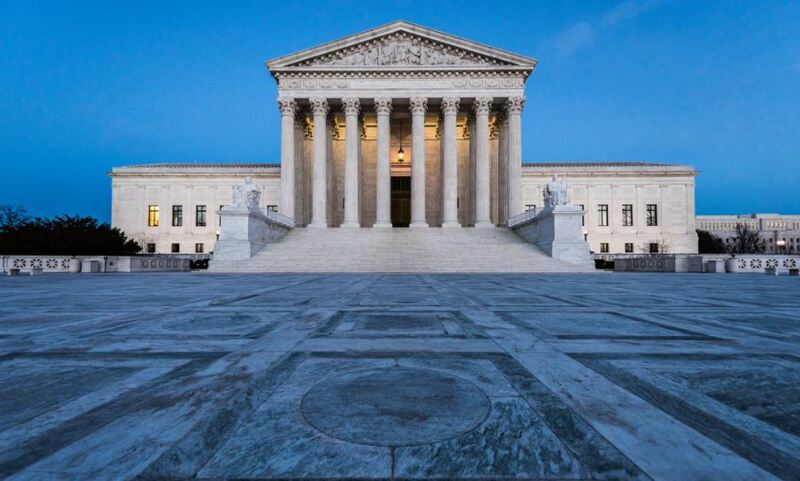 On November 13, the US Supreme Court threw out a case that would have ended public-sector unions entirely. Unlike Janus v AFSCME — the other anti-union case that SCOTUS is hearing — Hill v. SEIU wasn’t just a challenge to fair-share fees but to the very right of a union to be the exclusive representative of public-sector employees. “Exclusive representation” lies at the heart of American labor law. Following the proper procedural hurdles (usually a card drive and a secret-ballot election), a union is granted the sole right to represent workers in a particular worksite or to a particular employer. Without it, employers have no obligation to come to the table with unions; collective bargaining becomes nearly impossible. Unions across the country are likely relieved to have dodged such a direct attack on their existence. But they shouldn’t get too comfortable. As Janus shows, the Right’s more subtle tactics could be their most effective. The Hill case comes from Illinois. Several home-care workers represented by SEIU argued that having an exclusive representative speak for them is unconstitutional because it abridges their First Amendment rights to not have their speech be controlled by government. In effect, their argument goes, the union’s right to exclusive representation censors their own First Amendment rights to negotiate their own working conditions. If this sounds familiar, it’s because a very similar First Amendment argument is at the heart of Janus v AFSCME, which the Supreme Court will be hearing this term. In Janus, the plaintiffs are arguing that public-sector union fair-share fees force them to subsidize political speech with which they disagree. Both cases are backed by the same organizations — the National Right to Work Legal Defense Foundation and the Liberty Justice Center. Both saw amici curiae briefs filed by the libertarian Cato Institute and the Pacific Legal Foundation. But, unlike Janus, Hill v SEIU failed to muster even the four votes from the justices to merit a hearing. Why? The answer, I would argue, is that the Right is playing this game smarter than we realized. During the great wave of labor militancy that swept the country in the 1930s and birthed the modern labor movement, workers’ primary demand was recognition. The Flint Sit-Down Strike of 1936–37, perhaps the single most important labor action in American history, didn’t center on wage demands or insurance benefits. The deal that ended the strike, and handed victory to the UAW, was one page long with one main clause: recognition of the union. When unions can frame the fight with the boss as a struggle over whether or not workers have the right to a union, unions usually win, and they carry the public with them. The right of workers to associate together on the job is one that the American public broadly supports. Direct attacks on that right, like the Hill v SEIU case, give workers a rallying cry that would unite diverse voices in solidarity, just as it did in the 1930s. Moreover, legislatively ending collective bargaining rights for public-sector unions — killing them outright — would not only spur legal and constitutional challenges. It would come with a political cost. That’s why Illinois governor Bruce Rauner, whose entire governorship has been one long battle with public-sector unions, repeatedly promises he isn’t anti-union. “I do believe you should be able to join a union,” he said in 2015. On the other hand, the intricacies of unions’ day-to-day activities rarely make a splash in the public consciousness. In the same speech where he announced he wasn’t anti-union, Rauner also said the he wanted to “control the elements that are in collective bargaining.” That’s the same thing as being anti-union, but it’s more politically palatable. The details of what unions are allowed to do, what they’re allowed to say, how they’re allowed to spend their money — all this is too confusing, too arcane, and too inside-baseball. The Right’s formula for success may be to preserve the form of unions while eating away at their substance. We saw this with Wisconsin, where Scott Walker’s Republican allies in the legislature would have passed any law he proposed, including one outlawing public-sector bargaining. Instead, they allowed the unions to continue to exist while stripping them of all the rights and powers that make a union effective. We saw it this year in Iowa, where once again a right-wing government had the power to abolish public-sector unions, but settled for hobbling them. In Indiana, in addition to all the other humiliations inflicted on organized labor, the state will now (as of this year) send letters to all workers represented by unions with a membership number under 50 percent, telling them how to decertify their union. Why kill a union outright when you can leave it on the ground, defenseless and unable to resist? A labor lawyer once told me, “Organize, and the law will follow.” If unions continue to focus their resources defending labor’s institutional and legal protections, they will walk straight into the Right’s trap. They should focus instead on the militant organizing that brought them these protections in the first place. The first priority is a renewed focus on internal organizing — renewing labor’s people power through rank-and-file leadership development. If laws restricting union rights end up pushing unions to rely less on an expert-driven model and more on member democracy, that would be an important silver lining. An “extra-contractual” strategy combining direct action, electoral activity, and community action can help unions defend members’ rights without relying on the law. The restriction of shop-floor rights should also push unions to expand their vision beyond the workplace. This can counteract the narrative that greedy unions are the cause of nonunion workers’ problems. By fighting loudly and proudly for Medicare for All, a $15 minimum wage, affordable housing, and other issues that are outside the four corners of a labor contract, unions can reclaim their position as the voice not of a particular group, but of a whole working class. The laws that shackle unions will only bind us if we let them. We must find venues for action and struggle even if the law doesn’t permit them, and use those avenues to reclaim our power. Dave Kamper is a labor organizer in the Twin Cities. What’s Next After “Right to Work”?